We live in uncertain times. It seems like hurricanes, wildfires, flooding, polar vortexes, and other natural disasters are becoming more frequent. I shudder to think about the potential for man-made disasters (warfare, civil disasters, criminal or terrorist action) and the affect these could have on businesses. But that’s exactly why a key sustainable business practice involves emergency preparedness and establishing a business continuity plan. This planning is an essential management function. The organization’s leadership, beginning with the chief executive officer or executive director and board chairperson, need to be sure their business can continue to operate both during and after a disaster. The purpose of an emergency plan is to outline procedures and expectations for potential workplace crises, to ensure both the health and safety of all personnel and the continuity of core business functions. The continuity plan contains all the pertinent information needed to survive and recover from an emergency. Not having a plan or designing a poorly thought-out plan will lead to a disorganized evacuation or crisis response, which may result in confusion, injury, or property damage. A well-developed plan assists in re-establishing operations and allows the organization to quickly continue running after a disaster. The first step is to identify the key stakeholders within the organization who need to understand why the organization is embarking on business disaster preparedness. This includes, but is not limited to, members of the board of directors, funders, employees, contractors, tenants, vendors, and building personnel. Remind these stakeholders of their responsibility to protect staff and visitors, to continue to pay payroll and contracts, and of the ongoing need to focus on the organization’s mission, even during a disaster. Emphasize that the organization can no longer afford not to be prepared when it comes to a potential disaster in the workplace. There is no such thing as over planning. The more organizations plan, the more they increase the probability that their organization can effectively and efficiently be up and running so that they can turn around and assist the community. Explain to stakeholders that business disaster preparedness must become part of the organization’s culture. Just like the board of directors approves the budget annually and staff review monthly variances, best practices include involving staff at all levels in disaster preparedness. There are two types of teams that organizations need to consider establishing. The first team is the disaster preparedness team and the second team is the safety team. Some individuals may serve on both teams. The disaster preparedness team consists of individuals who are planners and does not necessarily include all the members of the executive management team. These knowledgeable team members focus on collecting the details, including, but not limited to, facility information, business documents, and identifying where critical business documents are stored. They can think through all the business intellect needed to function during a disaster and all the “what if” scenarios for the impact on the organization during a disaster. The safety team consists of individuals who are responders for the organization during a disaster. These team members should understand that they have specific responsibilities during a disaster; in particular, assisting with evacuations and responding if the organization must reestablish business in another location after a disaster. Well-intentioned people may volunteer for this role. Remember, however, that many people do not really know how they will react in a situation. These individuals are responsible for helping with an orderly evacuation or coordination with personnel when the organization’s personnel must shelter in place. Natural disasters: meteorological disasters, topological disasters, disasters that originate underground, and biological disasters. Man-made disasters: warfare and nonconventional warfare, civil disasters, criminal or terrorist action, and accidents (in categories including transportation, structural collapse, explosions, fires, chemical, and biological). Consider previous natural disasters in the geographical area and consult with the organization’s insurance broker and insurance agency. They can provide a list of areas of risk and give a history of disasters that affected the area. FEMA created a matrix that can be used as a guide to identify the type of emergency and probability, human impact, property impact, business impact, and internal and external resources. The human, property, and business impacts are potential losses associated with the threat. Property damage may include direct damage—for example, a fire—or indirect damage—for example, from the smoke. Evaluate the physical workplace to determine if the organization is sufficiently prepared. Identify floor plans with exits, fire extinguishers, first aid stations, and other important features. The disaster preparedness team needs to work with senior-level staff to identify critical business functions. Functions should include critical documents, processes, and personnel that are needed by the organization to continue running the business in the event of a disaster. Creating a template for managers and supervisors gives them the time to think through what information they would need to function in a disaster. Holding face-to-face meetings gives the preparedness team the opportunity to brainstorm with personnel to ensure they have not forgotten a critical business function. This is the perfect time to identify critical business vendors and partners and place their contact information in a central location. Ask key personnel, “Which vendors that you work with will be needed?” Examples include financial institutions, auditors, insurance brokers, payroll providers, call centers, community agencies, and other outsourced vendors. Once the disaster preparedness team completes the assessment and identifies critical business functions, they need to develop a plan for each identified type of potential disaster, starting with the highest threat area. A disaster response plan, also known as emergency preparedness and business continuity plan, is a road map for continuing operations under adverse conditions, such as a destructive storm or a critical incident. Personnel prepare for any event that could impact operations, resulting in a loss of or damage to critical infrastructure. The plan should detail how employees, tenants, contractors, vendors, board members, clients, and guests will stay in touch and continue doing their jobs in the event of a disaster or crisis. Creating a mechanism to obtain input from all stakeholders gives everyone a sense of security. Key functional areas or departments that can be affected by the disaster. Evacuation procedures (written protocols and procedures) that account for all personnel (employees, tenants, contractors, vendors, clients, and guests). Shelter-in-place locations (written protocols and procedures) that account for all personnel (employees, tenants, contractors, vendors, clients, and guests). Key personnel or positions and their roles and responsibilities (when positions are vacant, identification of who ensures the assigned role or task is covered). Critical business documents (that is, incorporation papers, bylaws, legal documents, financial institution information, building ownership or lease agreements, Form 990 tax information, audits). Key business processes and procedures (that is, payroll, membership lockbox). Identification of who has remote access to office systems and information technology. Collection of contact information for employees, tenants, vendors, and contractors. Confirmation of the organization’s contingency location. Whether the organization is faced with a natural or man-made disaster, it is vital to remember that critical business information and systems are at great risk, specifically those functions that require paper. Moving to a paperless environment and implementing cloud computing provides the ability to continue to function in a disaster. Conducting major business functions online, such as banking, payroll processing, product fulfilment, and communication with clients and members allows the organization to continue functioning during and after a disaster. Talk to other chief officers who have implemented electronic systems. Identify potential technology to be used prior to establishing a system, and, if necessary, obtain a bid from qualified vendors. Engage a knowledgeable information technology consultant. Once the organization has an electronically accessible system, the risk of a technological failure or utility outage in their building should be assessed and a back-up plan established for the electronically based system. Creating electronic systems that are accessible to the auditors of the organization would provide another layer of support. Distributing and communicating the plan involves all management personnel and the community. Organizations need to communicate with their community in order to develop a thorough plan. Management’s role is to support and fully participate in communicating the plan. For instance, when critical business information changes, is added or is removed, they need to inform the identified staff. It is the supervisor’s responsibility to hold staff accountable for taking the plan and drills seriously. Once the plan is distributed and communicated to all personnel, management needs to train personnel on established protocols and procedures. Training, running evacuation drills and shelter-in-place drills, and retraining becomes part of the organization’s culture. Completing a full test of the entire plan annually is highly recommended. Plan evaluation includes assessing the effectiveness of the plan and the readiness of the individuals involved. Debriefing after drills, incidents, and disasters guarantees that practices and protocols remain relevant. Members of the disaster preparedness team and safety team are responsible for reviewing the plan with senior management. The evaluation includes discussing what went well, hearing what could be improved, and identifying lessons learned. This process gives the organization the opportunity to revise, adjust, and update the plan, as well as to replenish emergency supplies such as food, water, and other materials. Every incident is unique and needs to be reviewed to strengthen the organization’s preparedness. Naming the organization’s public spokesperson. Outlining how stakeholders will be notified if the organization needs to close, delay opening, or close the office early. Defining the critical business operations (banking, payroll) and making sure the information on how to access them is in the plan. Working with vendors and outsourced staff to identify their roles and responsibilities during a crisis or disaster. Identifying who has access to critical business systems (Human Resources files, login information for computer systems). If executive leadership (the president or board chair, the chief executive officer or executive director, or the executive vice president or chief operating officer), is unavailable, it is imperative the organization identifies emergency succession protocols. Stakeholders need to know who to contact and who will be running the organization in the event of sudden death, non-availability during a disaster, or serious accident. Outlining these procedures gives stakeholders the reassurance that the organization has planned for every contingency. Assess – If the organization already has a disaster preparedness plan, begin by reviewing it. If the organization does not have a plan, identify persons who can conduct the workplace and threat assessment. Establish culture– Have the disaster preparedness process become part of the organization culture. Just like paying payroll, establish the expectation that disaster preparedness is a critical business function. Ask for assistance– Reach out to another community organization, contact building personnel or local authorities, or ask a consultant to help the organization get started. 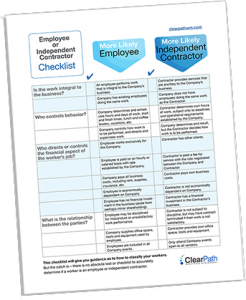 If all these things are keeping you awake at night, ClearPath can help you accomplish your day-to-day tasks pertaining to your workers. We recommend outsourcing your back office Human Resources and Payroll functions to our Employer of Record service. ClearPath is ready in the event of a disaster. Contact us to learn more about how our expert personalized service can let you get back to focusing on your business goals. Let ClearPath be the path to your peace of mind. Previous Post: « Is Your Organization Ready for the Multigenerational Workforce?